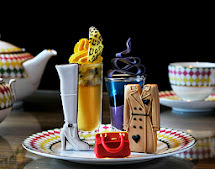 The Berkeley's Prêt-à-Portea adds a creative twist to the classic elements of the traditional English afternoon tea with cakes and pastries resembling the latest catwalk designs for the style conscious. 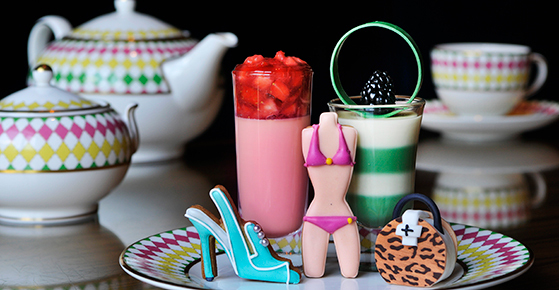 Manolo Blahnik’s slingback chocolate biscuit heel with baby blue icing topped with timeless pearls. Tory Burch’s glamorous violet halterneck biscuit bikini with magenta icing. Oscar de la Renta playful high-waisted peach-pink bavarois shorts embellished with strawberry compote rosettes. Dolce & Gabbana Sicilian chic pistachio green and vanilla striped pannacotta dress topped with chocolate ring. Jason Wu coconut “Carolyn” hatbox shaped cake bag sandwiched in retro leopard print chocolate. Balenciaga modern monochrome dark and white chocolate mousse dress set on a pecan nut brownie topped with flamenco ruffles. Alexander McQueen whimsical yellow honeycomb cream oversized dress topped with marzipan bee. Jonathan Saunders eye-popping ombré polka dot lemon and orange blossom dome shift dress set on a short bread biscuit. Prada Geisha-like white chocolate and Grand Marnier oversized coat embellished with red poppies. Prêt-à-Portea is served in the Caramel Room at the Berkeley from 1-6pm daily and is priced at £39 per person (£49 per person including a glass of Laurent-Perrier champagne or £55 per person including a glass of couture champagne).